The Turkish Prime Minister's recent visit to Iran respresents a significant shift in the foreign policy of both countries. The potential opening up of Iran offers both economic and political opportunites for Ankara but both Turkey and Iran have more to gain than lose by continuing to build stronger ties. As Western powers and Sunni Arab states united behind Saddam Hussein during the Iran-Iraq war, Iran had to pick its battles conservatively, therefore Tehran did not pursue a confrontational policy toward Turkey. 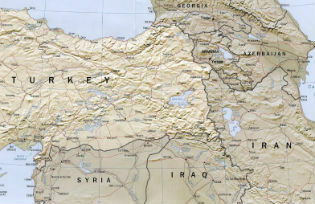 At the same time, Turkey (which viewed the former Soviet Union and Iraq as graver threats than Iran) maintained a neutral position during the eight year war. This enabled both countries to preserve the status of their relationship and created options for each toward the other in the future. Following the Gulf War relations began to thaw as Ankara and Tehran pursued cooperative measures to address the ‘Kurdish question’, which threatened both states’ territorial integrity. Bilateral relations blossomed after Turkey’s Justice and Development Party (AKP) rose to power in 2002. Iran welcomed the rise of an Islamist order in Turkey that stressed the importance of improving Turkey’s relations with its Middle Eastern neighbors. Over the past decade Turkish demand for Iran’s energy resources and Iran’s desire for reliable trading partners in light of the imposition of Western sanctions motivated the two states to enhance bilateral economic and business relations. Between 2000 and 2011 bilateral trade increased from $1 billion to $16 billion, and between 2002 and 2011 the number of Iranian firms based in Turkey increased from just over 300 to more than 2,000. Daniel Wagner is CEO of Country Risk Solutions, Senior Advisor with Gnarus Advisors, and author of the book “Managing Country Risk”. Giorgio Cafiero is a research analyst with CRS based in Washington.